Today’s Times has an interesting (though somewhat thin) story about the relationship between president Obama and Fox News. But now, with the presidential campaign entering its most competitive phase, the simmering tensions between Mr. Obama and the country’s highest-rated news channel threaten their fragile détente. 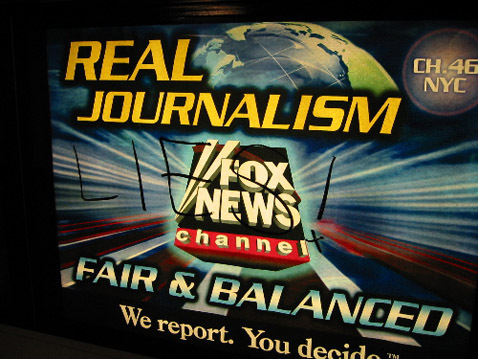 Problem is, Fox News is NOT the “country’s highest-rated news channel.” It is the highest-rated cable news channel, with about 1.3 million viewers. But it comes nowhere near the size of even the lowest-rated broadcast news channel. And it is still a tiny fraction of the combined audiences of ABC, NBC, CBS, and PBS, which have well over 20 million viewers in all. Thanks for making that very important distinction, one that I believe has been lost on many of us, frankly, as FOX has pumped up this propaganda to further its legitimacy. I’m not aware that there are any broadcast news channels, let alone any with millions of viewers a day. Perhaps you can identify these broadcast stations that air news 24 hours a day. Point well taken. That’s why I acknowledged that there was a bit of an apples-and-oranges problem. Still, I think Fox ratings need to be put into context.